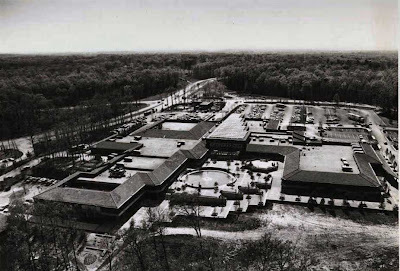 This is the Hunters Woods Village Center in all its glory, back before any nearby houses or apartments could mar its pristine view (or provide customers). It followed the then-emerging trend of the outdoor shopping plaza, where people would park and stroll through outdoor promenades to get to their store of choice, perhaps stopping to enjoy the fountain near one end or shout at hooligan kids on skateboards or scooters or whatever was popular in the early 1970s. Needless to say, as Americans grew more obese and began requiring crowbars to pry themselves loose from their Barcaloungers, the outdoor mall concept declined in popularity, and Hunters Woods fell on hard times. By the time the mid-1990s rolled around, Hunters Woods resembled a ghost town in the midst of nuclear winter, with just a grocery store, a dry cleaners, and a sad, small post office which required walking through several blocks of empty storefronts to reach, in constant fear of goblins or mutated zombines. Now, of course, the shopping center has been redeveloped as a perfectly ordinary strip mall where people get mugged in front of churches, the end. Hunters Woods Village Center was a terrific place in it’s heyday.. supermarket, bank, hardware store, bakery, three restaurants, ice cream shop, ABC store, drug store, library, and assorted small merchants and doctors offices. It was the location of the hugely popular Fritzby’s 10K race every year. I think petty crime in the late 80’s plus the concept of open strip malls and lot’s of parking did the Center in.. as it did the Tall Oaks Village Center as well. Moreover, from an environmental perspective, one can see the many dozens of mature trees and relatively small parking lots then. Compare that with the total absence of real trees and acres of (unused) asphalt at the center of the current HW center, which is fringed with small businesses plus Safeway & RiteAid. And thanks to the this wonderful re-do of HW center, RA is now forced to restore the neighboring Snakeden Branch, into which acres of rain runoff flow from the new Center's asphalt "non-permeable surface" parking lot. And wouldn't it have been nice, now that plans are in the making to increase nearby population density with high-rise housing, to have a somewhat natural environment to shop in in the future? But that won't happen with Hudgins pushing high-density development. Before nostalgia overcomes all of us, remember why all of those store fronts were empty. Drivers on Colts Neck and Glade had no clue what stores were in the center. Tall Oaks had the same problem and same result. They were both developed as part of a late 60s early 70s design fad. Contrast HW & TO failure with the success of SL and North Pointe developed in the 80s with stores visible from adjacent streets. Dix should have required more trees in the parking field during the renovation of HW but at least there aren't alot of empty storefronts in HW now. If you are looking for cheap prescription drug pharmacy, I would recommend you all to shop at eshoprx.com They are reliable, fast and believe me CHEAPEST. Ah, I remember the good ole 70's.